“TSV enthusiastically supports the refit of Alma Doepel, owned by not-for-profit company Sail and Adventure Ltd, an Affiliated Member of TSV”. She needs to return to active service in Port Phillip so she can continue offering youth development programs and acting as a living museum. The push is on to ‘Float Alma in 2019′. 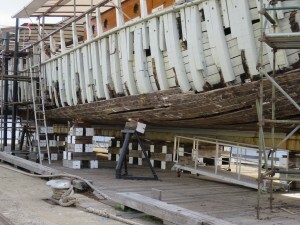 The restoration project has reached the final stage in completing the hull so the ship can be returned to the water. There is added urgency to complete the hull work as the Docklands development moves along North Wharf getting ever closer to the ship’s restoration site which has been our home thanks to the support of Lend Lease and Places Victoria. To see how you can contribute see Donate. Your contribution goes to the National Trust as indicated on the form. You will receive a tax receipt from the Trust. Please note that donations of $2 and above are tax-deductible. 8-day passage from Port Macquarie. The ship will be based at No 2, Victoria Harbour and will undergo a major refit before returning to her sail training role. Volunteers and sponsors are being sought and further details will be posted on the Alma Doepel web site.